Keeping track of your payments through Rover is easy. You can get payment details on every stay or walk you’ve booked, all through your Payment History. 1. Navigate to your Dashboard by selecting your name in the upper right corner of your screen. 2. 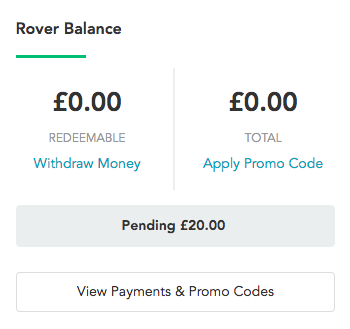 Under Rover Balance, select View Payments & Promo Codes. 3. Your payment history is broken into five tabs; Earnings, Pending Earnings, Withdrawals, Payments, & Other. Each tab has a complete list of all corresponding payments or bookings. They are sorted by date. Earnings: All of your completed bookings. Pending Earnings: Your current or upcoming bookings, that have not yet been paid out yet. Withdrawals: Funds that you’ve transferred out of Rover via PayPal. Payments: Bookings that have been completed for your own pets to a Rover sitter. Other: Coupons and any other miscellaneous account charges.